Sometimes called “big round filters,” the Kice CR Series filters were designed to handle large volumes of air up to roughly 50,000 CFM depending on the application. 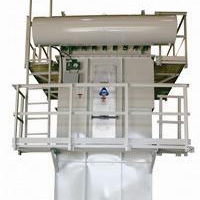 CR Series filters have self-contained cleaning systems that use a high-static fan to directly backflush air through a cleaning manifold that is continuously turning over the tops of the filter bags. Kice engineers developed the filter with the help of industry experts who had worked with many different types of “big round filters”. 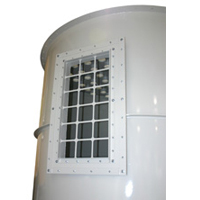 All CR Series filters have a walk-in, clean air chamber and structural support frames that allow them to be installed outdoors without the need for guy wires. 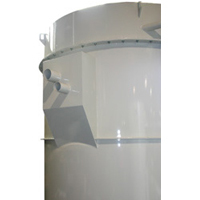 The CR Filter utilizes a high static fan that is mounted to the cleaning mechanism. The cleaning mechanism rotates directly on top of the filter bags providing continuous cleaning action. By resting direction on top of the tube sheet all of the air is flushed directly through the bags. High Air Inlets were pioneered by Kice. 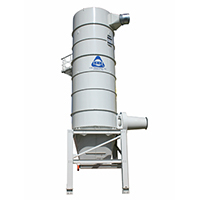 Located high on the housing, this feature reduces updrafts and the potential problem of dust being suspended in the filter. 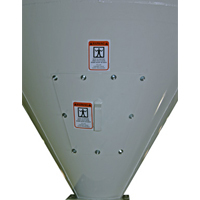 High air inlets are applied to most general dust control applications. 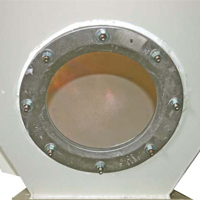 Cyclonic Inlets are used on round filters that are filtering air streams with a large amount of product. 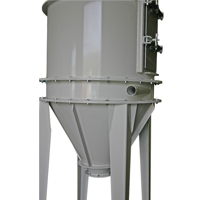 The cyclonic action that occurs inside the filter directs dust into the hopper and out of the filter. Kice Electric Control Boards provide skip sequential cleaning of bags. 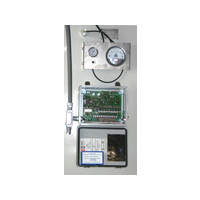 Boards are mounted in NEMA rated enclosures. 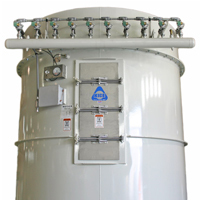 All pre-assembled Kice filters are wired complete prior to shipment. Rated Explosion Panels are available whenever the application requires them. The number of panels are determined by the specific product and the size of the filter. Vent ducts are also available for venting through exterior walls. Some other custom features available are the Weather Enclosures and Level Indicators.